“You won’t know yourself once you start driving”,“Cycling will save you so much time.” These are the words of persuasion that I hear on a daily basis. Urging me to ditch my favoured mode of transport. They are words motivated by the capitalisation of time and centred on moving quicker. But the thing is, most of the time, all I want is to slow down. 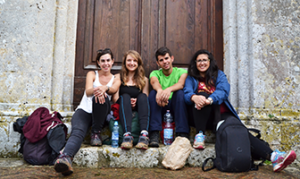 It’s for this reason that three days walking the Via Francigena in Tuscany from San Miniato to Siena with three of my wonderful colleagues was my absolute dream. There are few greater pleasures in life than fresh air, good food and great company. All that was missing was the option to throw my phone across the Atlantic Ocean and to never have to look at a screen again. Sadly this was not possible. Footfall mimics the heart’s beat. It’s an innate pace that allows us to look outward at the world around us taking it in, one step at a time. It’s a divine slowness that allows the most precious of moments to unfold. Spilling packets of seeds into the hands of strangers and swapping sandwiches f or stories of faraway lands. There is something about walking from one place to another that instils a sense of unity. People from all walks of life, regardless of age or occupation, gather together with one goal. When we walk there’s no demographic, no discrimination and no divide. 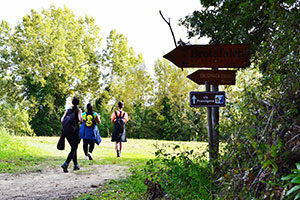 Your experience of the Via Francigena will be as different to mine as there are shades of green on Tuscan hills. Nonetheless it is is my experience and I’m going to share with you some of the moments that made it what it was. We shared a treasured moment on d ay three when we took shelter at the door of a monastery just as the rain started to fall and began tucking into our packed Focaccia. There’s no silence quite like the sound of four ravenous pilgrims taking their first bites of lunch. Later, that day we would be soothed by the sound of a number of tiny bells hung from the necks of sheep and ringing as they grazed. A fluffy orchestra to soundtrack our journey. There was our encounter with the warm-hearted German’s who insisted on treating us to lunch in San Gimignano and with whom we discussed a concept we dubbed, The Golden Triangle. The Triangle’s three points are: Money, Time and Energy and at various points in your life you have either two of the three. There was the kind stranger who gifted me their spare waterproof when I failed to pack one in haste and with whom I later swapped pens as a memento. And Alberto from Sardinia who insisted on taking us on a personalised tour of Siena. And of course the Tuscan landscape, an infinity of soft rolling green hills that appear like sand dunes on the beach as if you could wipe them away easily with your hand and have them reappear the next day. The spectacular light display as the sun began to set at the end of each day, applauding us for all of our hard work. The medieval walled cities, with tall towers and beautiful brick work where one can wander back in time and become inspired by Renaissance art and architecture. Our sojourn on the Via Fracigena is an experience that won’t easily be forgotten, if not for the fine food and stunning scenery but for the sheer pleasure of slowing down in a world that can’t stop moving. I’d love to hear your thoughts on my experience and how it compared or contrasted to yours. 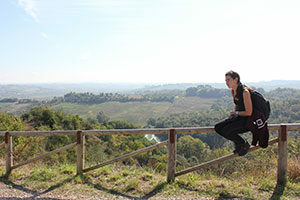 For more information about cycling or walking the Via Francigena in Tuscany or to book your Camino to Rome trip contact our travel specialists.